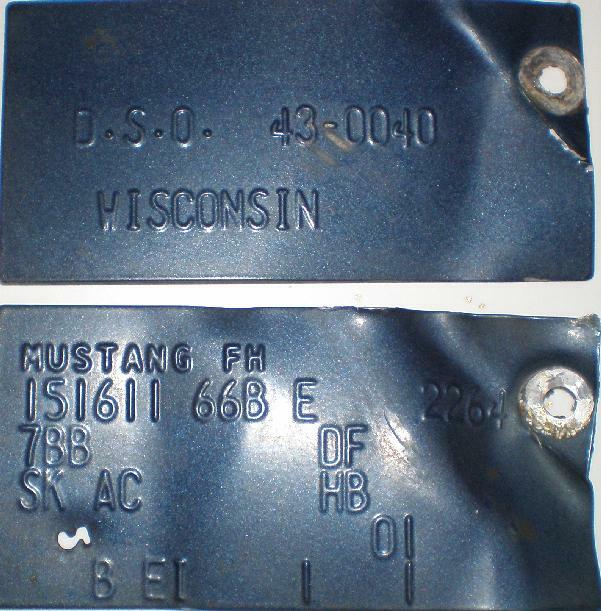 All Fox-body Mustangs produced originally had a body buck tag affixed to them as they made their way down the assembly line. 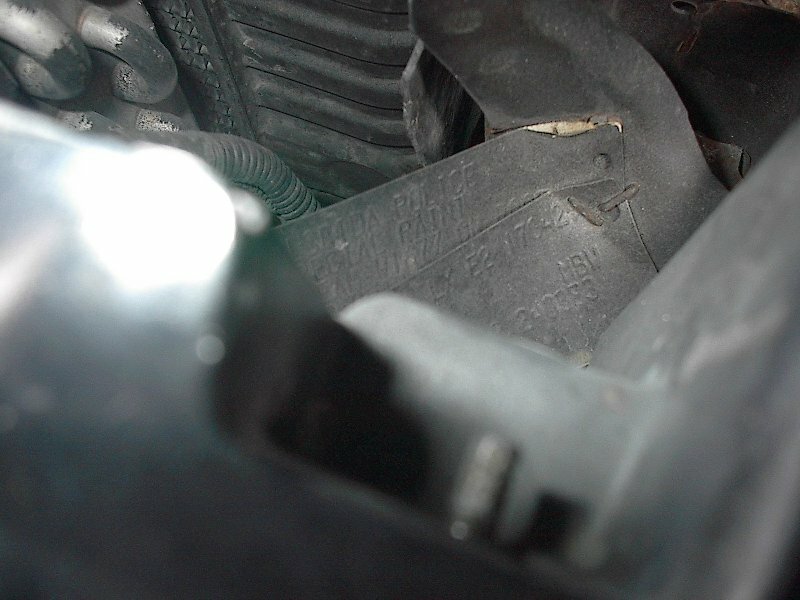 These tags are usually found on the front radiator support, and are imprinted with specific, decodeable data relating to that specific car. This data includes the last 6 of the VIN and some of the options that the car was originally equipped with. 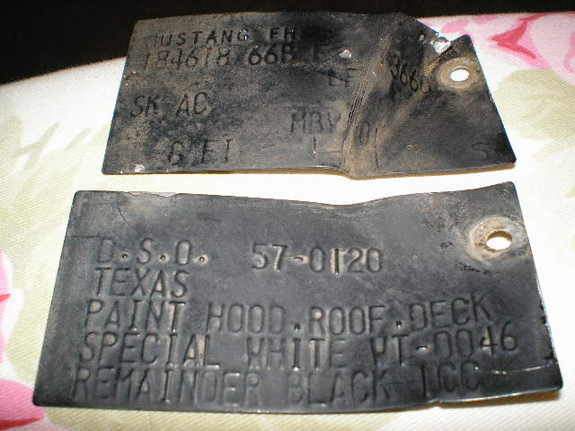 Most Special Service Mustangs also had an additional buck tag placed in or near the same area, sometimes referred to as the DSO buck tag. 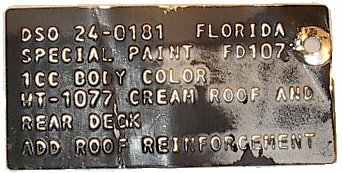 These tags list the DSO code, agency-specific paint instructions (if the car was a special-paint car, such as a two-tone scheme), and sometimes include the the name of the ordering agency. A generic DSO POLICE tag is often seen when the agency name is not included. 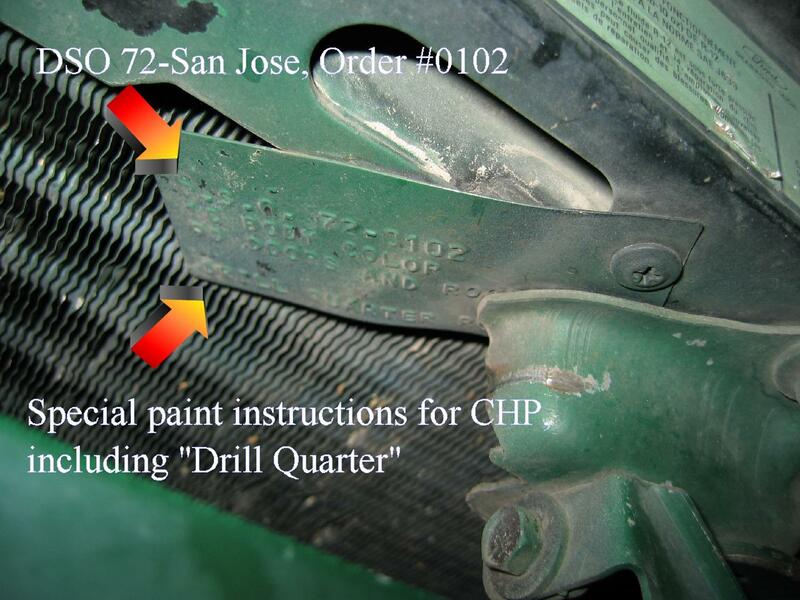 These tags could also show specific instructions to assembly-line workers to remind them as the car went down the line, such as on the example 1982 CHP tag below, "DRILL QUARTER" (for the Antenna Specialists antenna mount that CHP used). 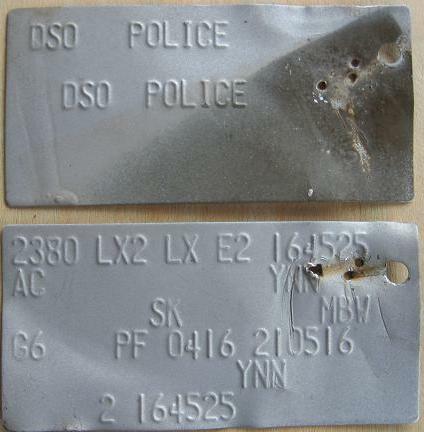 The early SSPs had these body buck tags and DSO tags affixed with a screw, and they were not always attached in the same spot or even placed together. 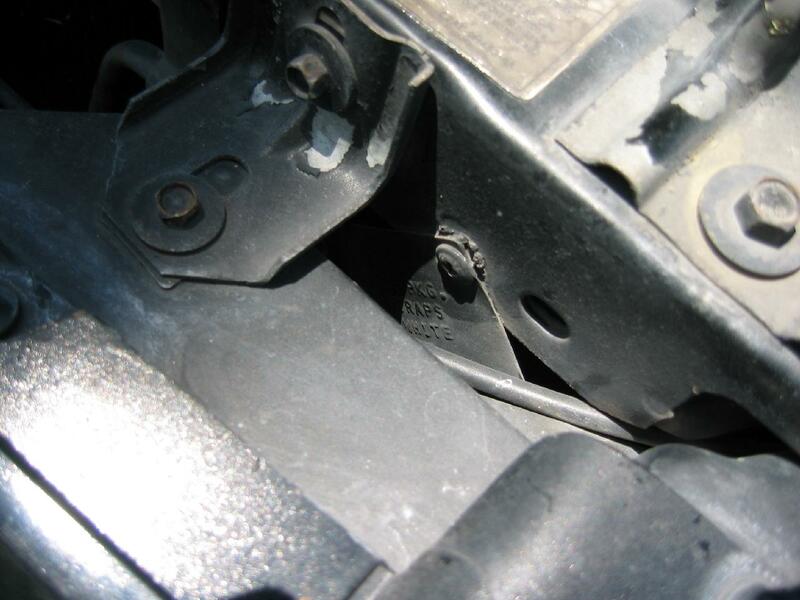 The later (around 1988) cars were stapled down to the core support behind the driver's side headlight area (and are pretty hard to see and get to sometimes). 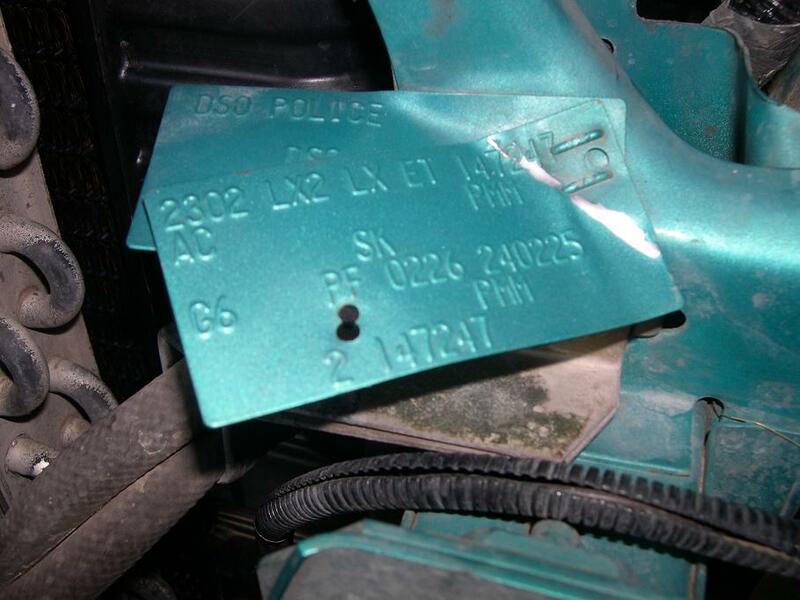 On later cars, the last six of the VIN were also stamped on the second DSO tags. 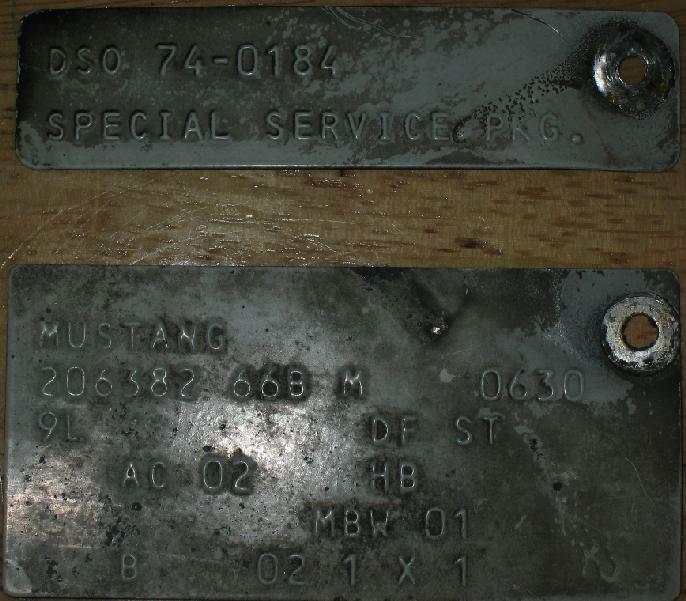 It's important to note that not every SSP left Ford with a DSO tag, and they were used for other special orders as well. 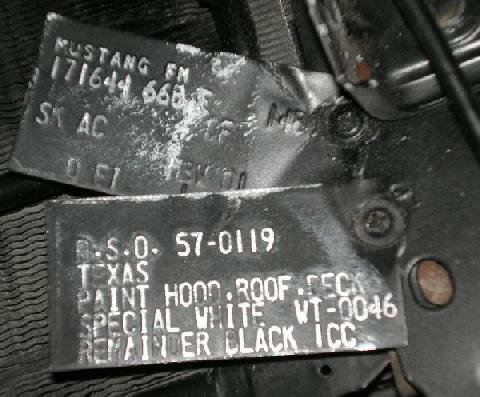 The mere presence of two tags does not confirm the car as a Special Service Mustang. 1982 California Highway Patrol Mustang showing both buck tag locations. 1983 DSO Buck tag, Texas Department of Public Safety. 1983 Texas DPS, both Buck tags (bumper support bracket removed). 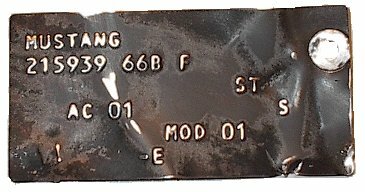 1985 California Highway Patrol Mustang's DSO Buck tag. 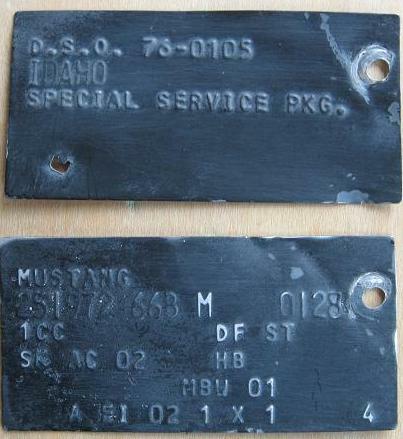 1985 Oregon State Patrol Mustang Buck tags. Smaller DSO tag (non-special paint car). 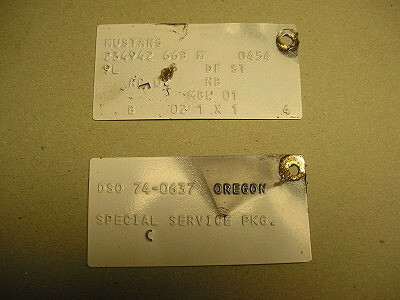 1985 Oregon State Patrol Mustang Buck tags. Another smaller DSO tag. 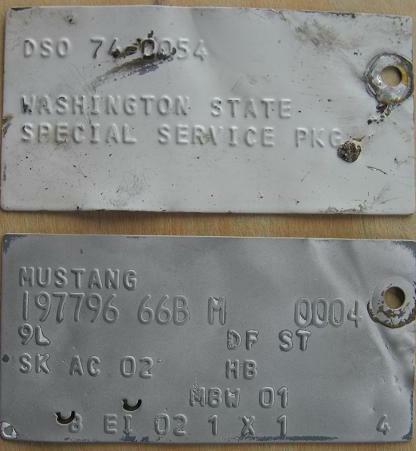 1985 Oregon State Patrol Mustang Buck tags. Normal DSo tag. Mark (84OregonSSP) photo. 1986 Texas DPS DSO and Body Buck tags. Casey Blackburn photo. 1986 Washington State Patrol DSO and Body Buck tags. Jim Young photo. 1986 Idaho State Patrol DSO and Body Buck tags. Jim Young photo. 1987 Texas DPS DSO and Body Buck tags. Matt Buckmaster photo. 1987 (still attached with screws). Matt Buckmaster photo. 1987 Wisconsin State Patrol DSO and Body Buck tags. Photo from Dan (Ex87WSP). 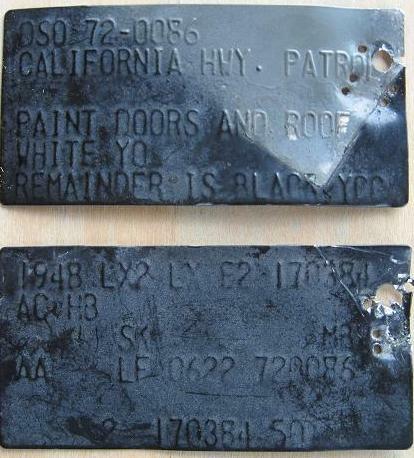 1990 California Highway Patrol DSO and Body Buck tags. Jim Young photo. 1993 South Carolina Highway Patrol DSO and Body Buck tags. Jim Young photo. 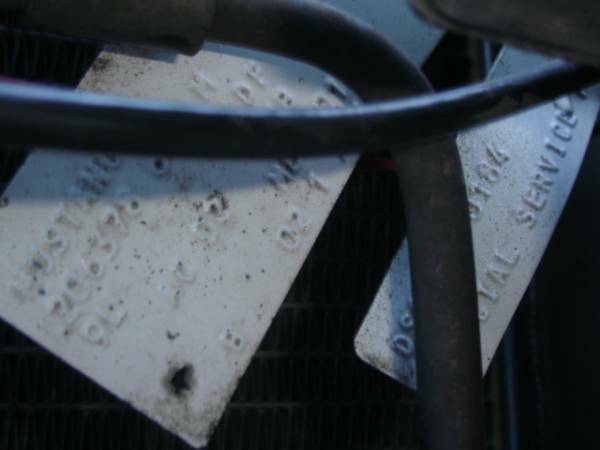 1993 Florida Highway Patrol tags, stapled to the front radiator support. 1993 Florida Highway Patrol DSO and Body Buck tags, unmarked car. Bret Traywick photo. 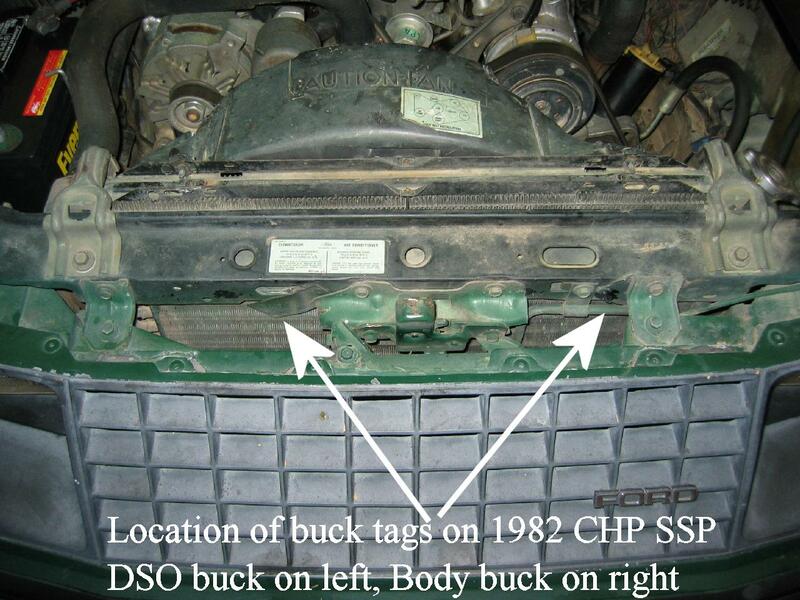 As shown in some of the examples posted, there really doesn't appear to be a method to how or what was printed on the DSO buck tags, as compared with the body buck tags. Sometimes, specific agency names were stamped on the DSO tags, and other times the generic "DSO POLICE" was used instead. 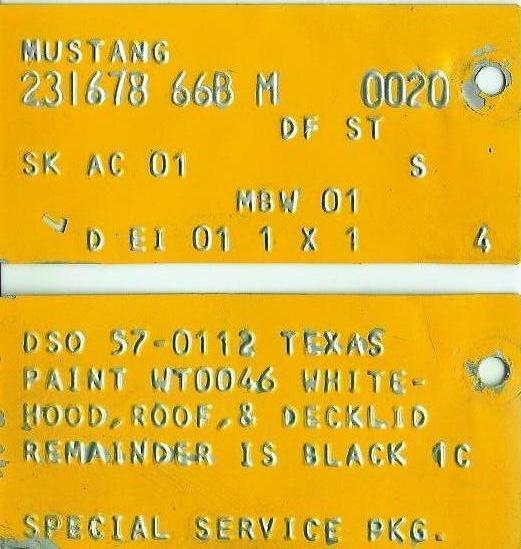 Most of the special paint cars appear to have had the paint instructions on the tags, but sometimes only the DSO number was on stamped on them and not the agency name. Some very early, non-special paint cars (1983-1984) have even been seen without a second DSO buck tag.